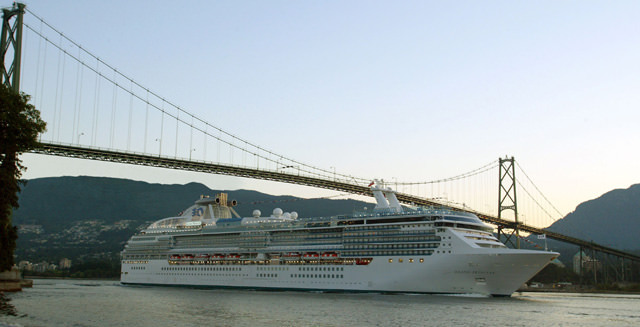 The lovely Coral and Island Princess are the largest of the midsize ships in the Princess Cruises fleet. Just barely small enough to fit through the locks of the Panama Canal at 91,000 gross tons, they can be deployed on cruises to Alaska, the Caribbean, or anywhere else in the world for that matter. Not that the Island Princess is a small ship by any measure. With only a few more passengers than the ships of the Sun Class, there’s plenty of room onboard, which makes the Coral Princess right at home alongside its much bigger cousins. From the outside, the futuristic-looking Island Princess bears a passing resemblance to the Diamond and Sapphire Princess; that’s because it also has a jet-engine like decorative element on the funnel—an indication that the Island Princess also is powered by an environmentally friendly combination of diesel-electric and gas-turbine propulsion systems. Inside, the Island Princess serves up the most important hallmarks of a Princess ship to live up to the “Big Ship Choice, Small Ship Feel” motto. There’s a nautically appointed Wheelhouse Bar; the Asian/African-inspired Explorer’s Lounge for cabaret-style acts (and doubles as a sports bar); a sloping, single-level theater for full-scale production shows and educational lectures; plus an unusual multipurpose space called the Universe Lounge, which is used for enrichment programs such as computer classes and cooking demonstrations. Also present is Princess Cruises’ signature wedding chapel, a library, card room, cigar lounge, piano bar, internet center, play areas for the kiddies, and last-but-not-least a spacious casino. 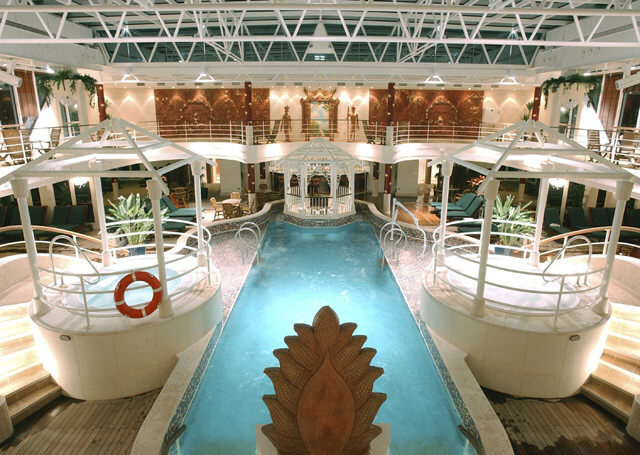 Traditional and Anytime Dining are accommodated in the ship’s two single-level dining rooms. Two more alternative restaurants include the trademark Sabatini’s Tuscan-inspired trattoria and the New Orleans-themed Bayou Café and Steakhouse. Another signature Princess eatery, the 24-hour Horizon Court, offers a casual setting for buffet service. Pool areas include the customary main pool amidships and a Balinese theme solarium/spa pool aft, protected from inclement weather by a sliding glass roof. The latter is part of the ship’s Lotus Spa fitness center. Other recreational facilities include a sports court for basketball and volleyball, plus two types of golf: computerized and miniature. 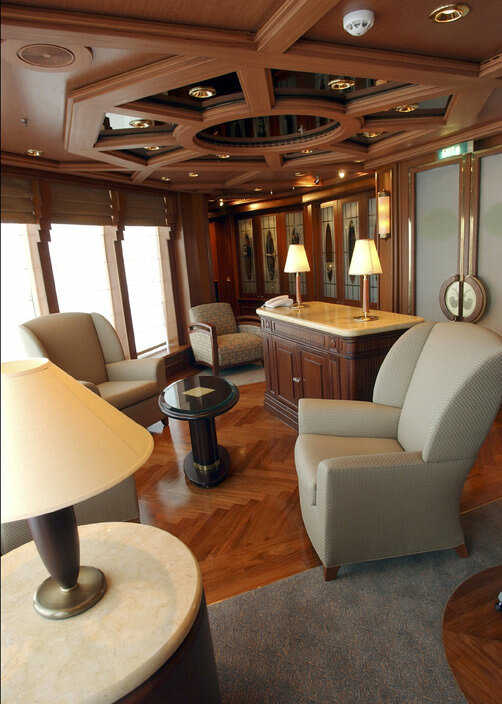 Cabins are a bit bigger than aboard similar ships in the Princess fleet, but with the same basic layout and California-inspired décor of earth tones, off-whites, and light woods. Private cabins abound (a Princess trademark), with 83 percent of the outside cabins offering this popular feature, but the tiered design means that people in cabins above can see down on you. Want My Help With Your Princess Cruise?